Mount Washington is snowy. Very snowy. So snowy, that when you ride the chairlift to the highest peak in the area (a little over 1500 metres), a local can tell you that the enigmatic lumps and bumps you can see peeking through the fluffy stuff are, in fact, twelve feet tall fences designed to retain snow in low snow years. So snowy, that the snow piles up in ridiculous wind-blown mushroom shapes around the rocks, trees and lift pylons. Snowy enough that when I look at the snow report, a tear comes to my eye when I read that they got *another* 36cm overnight. Before we left the UK, I read Charlie English's book "The Snow Tourist", about his search for the snowiest places on the globe. In the course of his travels, he came over to the west coast of British Columbia and Washington State, but I don't think he made it to Mount Washington. That's a shame, because in spite of its relatively low altitude, I heard rumours that the area regularly holds the title for the deepest snow pack in North America. None of this was a factor in deciding to go there, although it's all useful stuff during the mildest January/February on record here in BC. 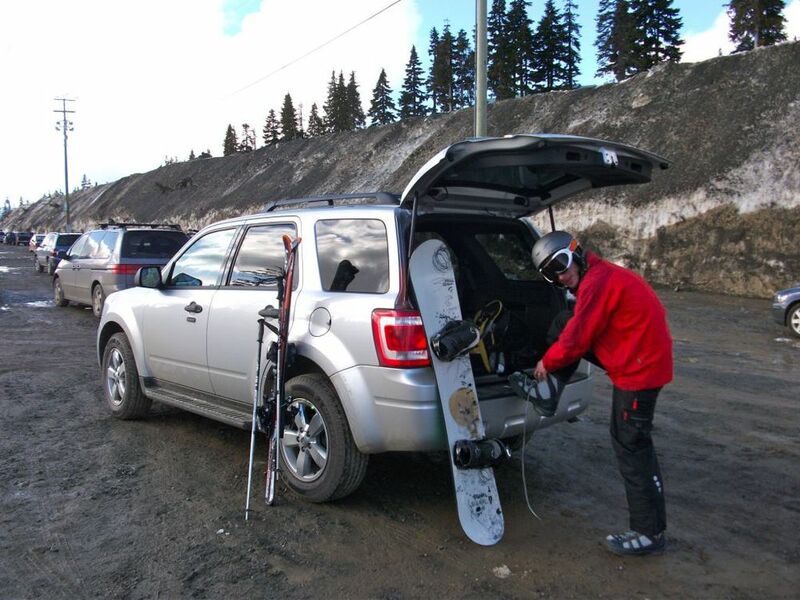 Put simply, we had a week off, were going to Vancouver Island, and wanted to ski. The mountain area beside the Comox Valley is on the North East coast of the island and we motored up the coast after nipping onto a ferry from West Vancouver to Nanaimo, Vancouver Island's second city. 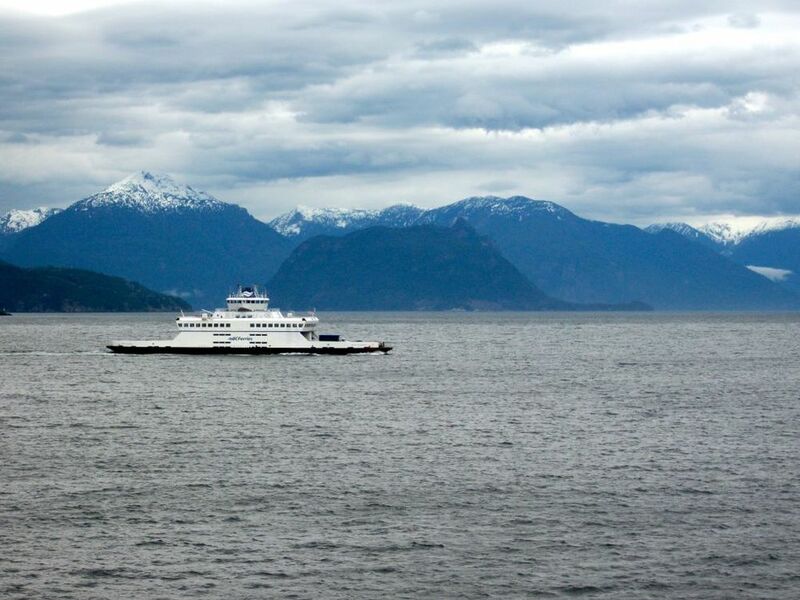 The fjord-y nature of the coast of BC means that ferries ply the waters all around this area, and catching a ferry is treated as casually as using a motorway in the UK. Turn up, pay your fee and follow the instructions; if you're going to/from Vancouver Island & the mainland, it takes about an hour and three quarters for either of the main routes. Mount Washington has, apparently, been developed a lot over the last ten years, but even so, the parts of the mountain given over to pistes and lifts is still pretty small. There's one main chairlift to the highest peak, and a couple of supplementary lifts to peaks on either side, but you can't daisy-chain together a lot of lifts to get really high up and then spend ages skiing back down. Thankfully, chance had intervened and ensured we didn't travel during Spring Break (which might have meant big queues); as it was, we were able to go up and down the mountain numerous times, exploring the routes and glades. 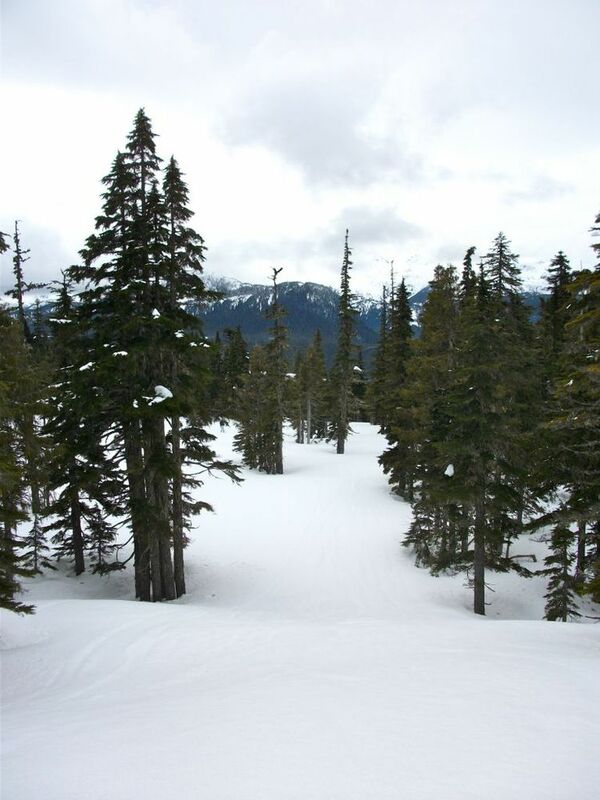 I think this is the view down a little-used black route called "Schum's Delight" which we spotted from the chairlift. It proved interesting fun but we hit it at exactly the right time, as the sun melted the crispy powder coating. Dave spent more time than I did aiming at trees; I'm still convinced this is easier on a board. Quite chilly out of the sun, too. During our first day, the skies were blue and sunscreen was a necessity; the second day was much colder and it started snowing around lunchtime, getting into full swing by about 3pm. 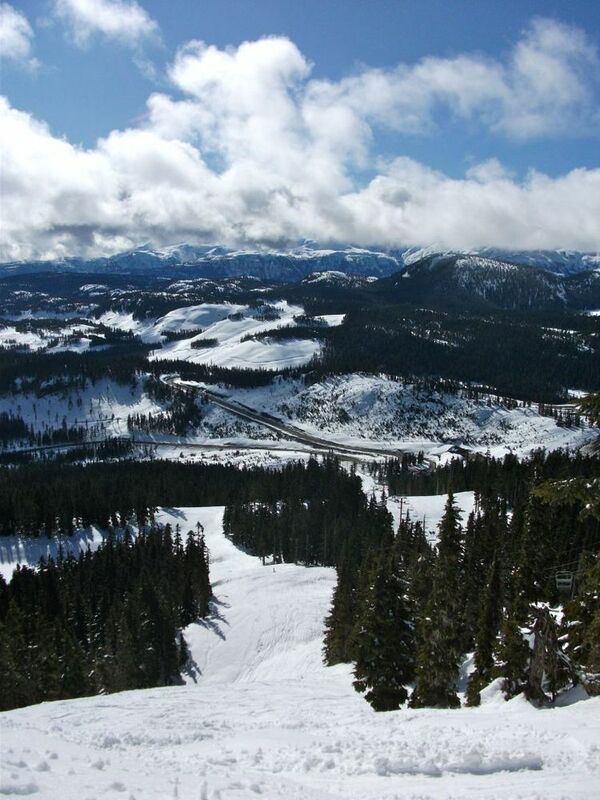 I guess to have a snowpack you have to have snow. But it made for interesting conditions when Dave went down the snowcross run for about the fourth time: no visibility, snow freezing fast… all good fun. Yee and indeed Hah. Everyone on the island drives this sort of thing (necessary if you're going to travel on logging roads to more remote areas) but it comes as something of a surprise when you book a Yaris. The salesman's justification that "it's only 2 wheel drive" just left me contemplating the point of everything. I can imagine that the pisted area would be a bit limiting if you lived in the area, at which point you'd start heading out into backcountry – there's certainly plenty of that, including a whole section served by a lift that we didn't even contemplate trying in the icy conditions on day 2. But for a weekend, especially in the sunshine, it's pretty neat. Apartment, chalet, hotel? What's it to be? 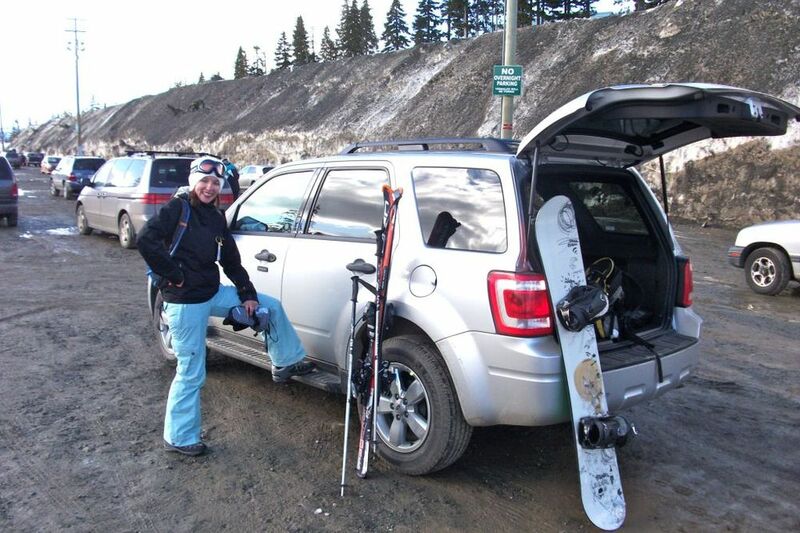 Over the years, Dave and I have tried various ways of staying in ski resorts, including all of the above. For our trip to Mount Washington, we stayed in a hostel – but not just any hostel. Oh no. We stayed at the Riding Fool in Cumberland. Cumberland is a small town inland from the main highway on the island, in the direction of the Forbidden Plateau. No, we didn't go there, and yes, it is now on my list of places I really, really need to visit. Cumberland as a town was founded on mining and thrived at the end of the 19th century when migrants poured in to build wooden houses and work in dirty, dangerous conditions mining coal. As the coal seams dried up, logging took over as the main business. Now that clearcutting is going out of fashion (here's hoping, anyway), some in the town are looking to tourism for a new source of income, not least amongst them the Riding Fool hostel, Dodge City Cycles bike shop and Tarbells Cafe, all housed in a restored heritage building on the main street. The folks behind the hostel, bike shop and cafe have spent the last ten years developing the mountain bike trails in the area, starting a series of bike races, a cycling collective and generally making the area a 'hidden gem' for mountain bikers and other outdoorsy types. Don't take my word for it – the area featured in Mountain Biking UK's March 2010 edition. I loved the hostel, and the area; there's a real sense of inspirational individuals getting together and making things happen in a way that meets the needs of a community, and which brings pride and aspiration back to the area. The hostel itself is designed to get you mingling; while the rooms are small, the enormous kitchen, dining area and living room (with wifi & PC, pool table, darts, board games and a massive wood-burning stove) encourages you to laze away the aches and pains of an energetic day in company. All the renovation work is sensitive and thoughtful, with reclaimed timber, local stone flooring, sanded floorboards and poured concrete worktops setting the tone. There are limited options for dining out (though we made the most of a '$4 burger and $4 beer' night at the local pub) but there's an organic grocery store, excellent bakery (lavender shortbread comes highly recommended) and local butchers supplying steaks for $3-$5 which kept Dave happy. For my money, the only thing which could change to make the hostel even better would have been en suite bathrooms but hey, it's a hostel, the bathrooms had great showers and seemingly unlimited hot water, and I didn't have to queue for a shower at any point. I couldn't vouch for an identical experience when they accommodate mud-splattered mountain bikers recovering from a race, but I think if you're taking part in a mountain bike race, you're already a lot harder than I am. To read more about the experience of riding around Cumberland, have a read of this. This bloke clearly knows more about it than I do. One final note on Cumberland's renaissance as an adventure sports shangri-la. By chance (i.e. I was having my first go driving the ridiculous car, and its automatic gears) Dave and I drove down a little road at the back of town, towards the lake. Who expects to see a big archway proclaiming Cumberland's China Town in a swampy area where all you can hear is the incessant croaking of frogs? Not me, but it turns out that this part of town, partially submerged, was set aside for Chinese and Japanese migrants who arrived to work in the mines at the end of the 1800s. 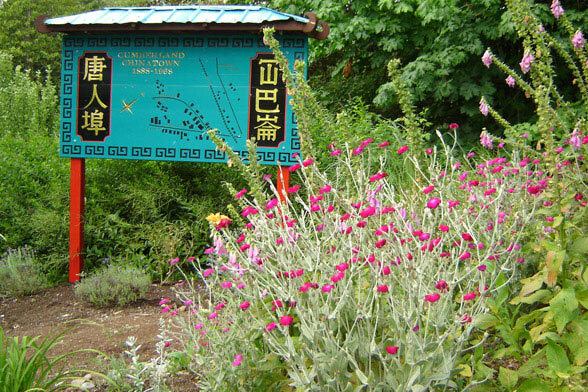 China Town developed to include stores, schools and theatres, meeting the needs of a community almost 3000-strong. Fire destroyed many of the buildings in 1935, and the remaining buildings were broken up for their materials, with the last inhabitants leaving in the 1960s. Now there's marshland and signs; nothing else remains. Image from the Cumberland Chamber of Commerce website: http://cumberland.org. Great write-up. The Schum’s Delight pic is amazing, Gursky would be proud of that I think. Thank you! As per usual, the good pictures are by Dave.